After spending many hours on a cross-stitched project, you can display it in your home or give it as a gift with a frame. Before framing a cross-stitched project, consider what kind of frame you want, where the project will be displayed, and how much you want to spend on a frame. Frames can be very expensive; but if you don't have experience framing, you should take your project to a professional framer. Wash your cross-stitched project in warm water with a few drops of dish washing soap, allowing it to soak for 15 minutes. Rinse with cold water and air dry. Press the piece by laying a piece of cotton on top and then using a low setting on the iron to gently press away any wrinkles. Take your finished cross-stitched project to a framing store and choose a frame and mat that compliments the piece's size and aesthetics. Since most projects are smaller than the fabric they are sewn on, the frame should be larger than the cross stitch but smaller than the whole fabric. The frame should come with backing and wire or sawtooth hanger, but you may need to order a piece of glass that will fit in the frame. Check with the frame shop to see what you will need to order separately. Purchase a foam core board that will fit in your frame. This is a thick piece of foam that is covered in acid free card stock that will hold your project in the frame. Center the piece on the foam core board with the edges of the fabric falling over the sides of the board. Push a steel pin into the top right corner of the fabric and foam on the edge. 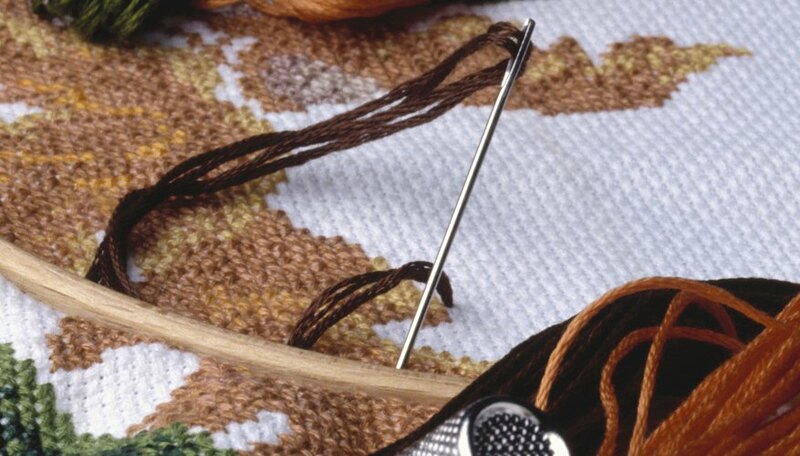 Facing the cross stitch, the pin shouldn't be visible, it should be on the top of the board. Stretch the fabric to the top left corner and place a pin. Pin the bottom corners while stretching the fabric tight, but not so tightly that the cross stitch distorts. Continue pinning about every inch all the way around the edge of the foam board. Turn the board and attached cross stitch over and fold the fabric on one corner so it lies as flat as possible. Pin in place. Fold the other three corners and pin in place. Sew each of the corners into place and remove the pins. Place your mounted project in the frame and secure the backing.